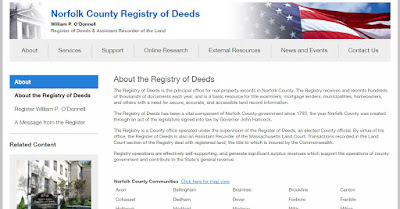 Continuing his efforts to combat consumer fraud, Norfolk County Register Of Deeds William P. O'Donnell today advised Norfolk County residents to disregard a direct-mail solicitation offering them a certified copy of their property deed for an outrageous fee of anywhere from $59.50-$83.00. Register O'Donnell stated, "Today, there is a California company that is sending direct-mail solicitations to unsuspecting homeowners asking them to send a check for $83.00 in order to receive a copy of their deed. If a consumer knew that the Registry of Deeds would provide them the same certified copy of a property deed for a charge of only $1.00 per page, plus an additional $1.00 for postage, they would never agree to pay such an outrageous fee for service. The average price for a mailed homeowner's deed by the Registry, (usually two pages) is $3.00." "These solicitations," noted O'Donnell, "are labeled Recorded Deed Notice and request that that homeowner forward a check in the amount of $83.00 for a copy of their deed. The Registry has been contacted by many who have received this solicitation. Do not fall for this scam." Register O'Donnell concluded, "While the practice may be legal, it's certainly not ethical. From my perspective, this is a scam being perpetrated against hard working Norfolk County residents, many of who are first-time homeowners or elderly. Consumers are interpreting these notices as a bill, since they are affixed with a due date. I again urge in the strongest terms that Norfolk County citizens not let themselves fall prey to these types of misleading deed scam advertisements." 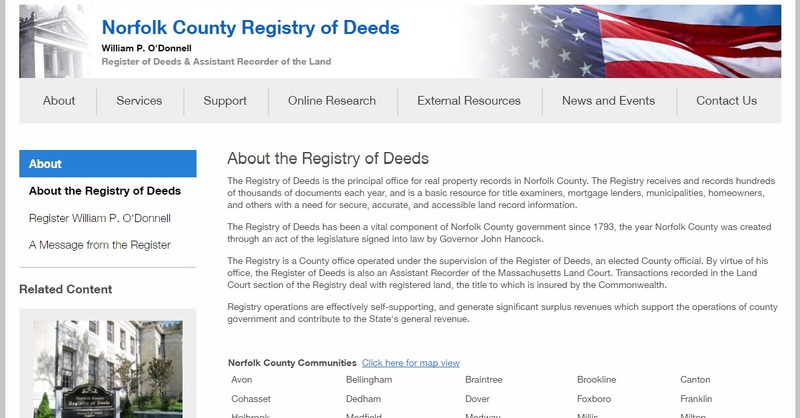 If you receive a deed solicitation notice, please contact the Registry's Customer Service Center immediately at (781) 461-6101 or by email at registerodonnell@norfolkdeeds.org. Additionally, if you desire a copy of your own deed, also contact the Registry's Customer Service Center and we will be glad to provide you with one for a nominal fee of usually $2.00-$3.00.